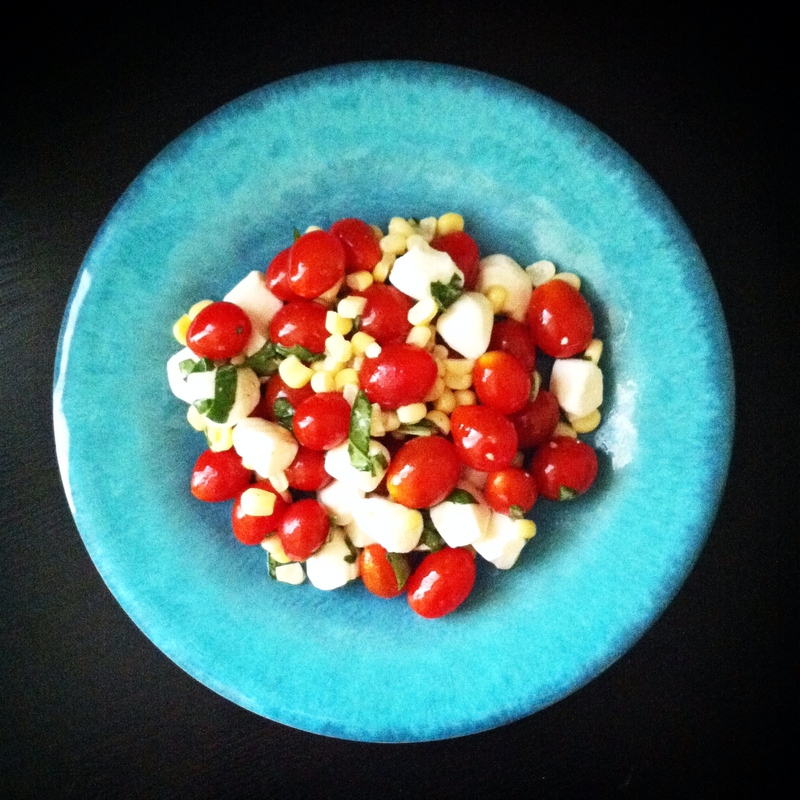 sweet corn caprese salad | omfg. so good. “S” is for summer, salad, sweet corn and… STIR-CRAZY. I grew up on the east coast and remember feeling this way in the dead of winter. The novelty of change of season had worn off and I just wanted to be able to go outside without having my nostrils freeze together every time I took a breath. It’s like I’m struggling through bizarro winter now. The middle of July, zero reprieve in sight. I look out the front window and see a bright blue sky and THINK it might be nice to get out for a walk or take the kids to the park for an hour. Then I start to load everyone into the car and realize that would be the dumbest idea I’ve ever had. So instead we go to Target for the 10th time in two weeks just for a change in scenery, then wait for the sun to go down so we can go swimming in our giant backyard bathtub. Yes, ironically I’m now longing for the dead of winter. And, I’m still making a lot of salads for dinner. See where I went with that? Combine the tomatoes, mozzarella, basil and corn in a large bowl, toss to combine. In a separate bowl, whisk the balsamic, olive oil, sugar, salt and white pepper, then pour over tomato/corn mixture. Toss to combine.